Hey you guys! 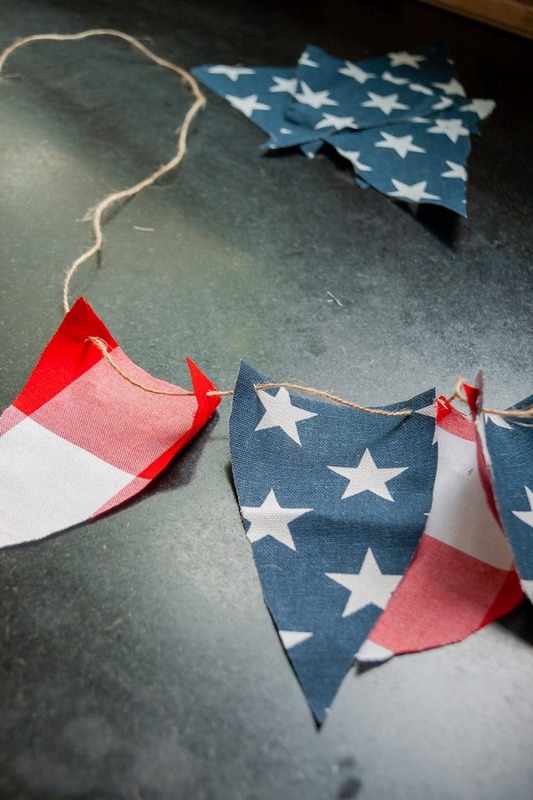 Today I created a little 4th of July Banner. 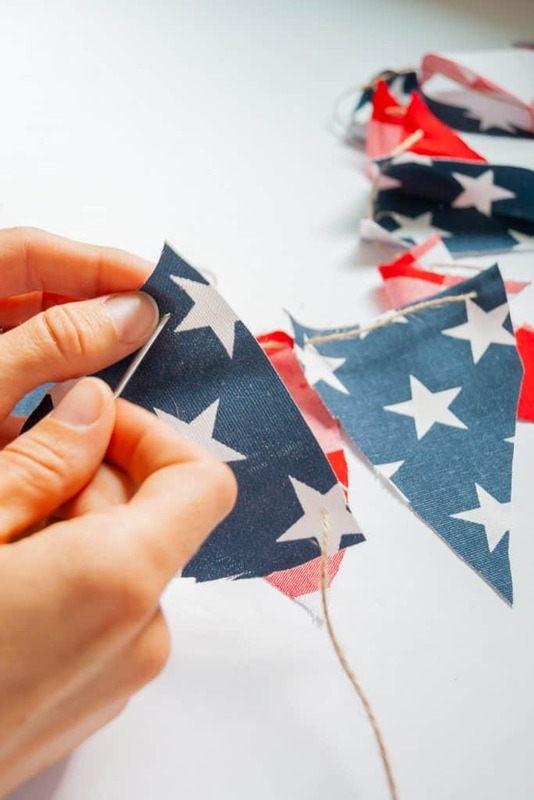 With twenty minutes and a little red, white and blue fabric – you can create this cute decor item for summer. I actually saw a really cute patriotic banner at Pottery Barn and that served as my inspiration. This is so easy to do. Read on! 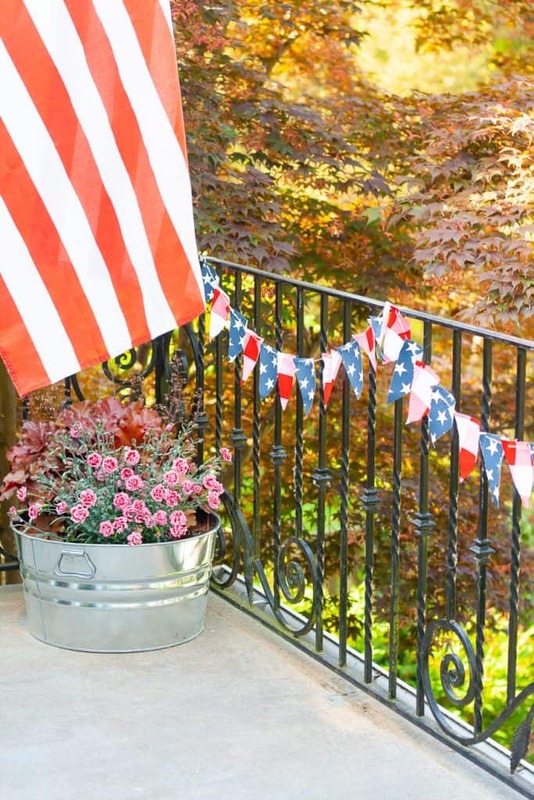 I recently saw this really cute and festive 4th of July banner on Pottery Barn and instantly wanted to try and recreate it! You can hang these banners in your house or outdoors (as long as it’s not raining). 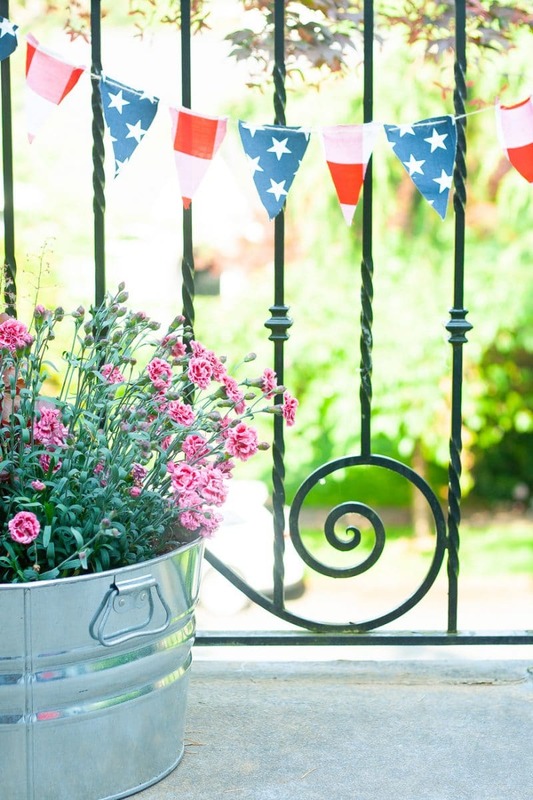 It’s a great way to decorate for 4th of July. I am always looking for easy, inexpensive but nice looking decor for the summer holidays. Last week I made these red gingham frayed napkins and I had some leftover fabric from that. 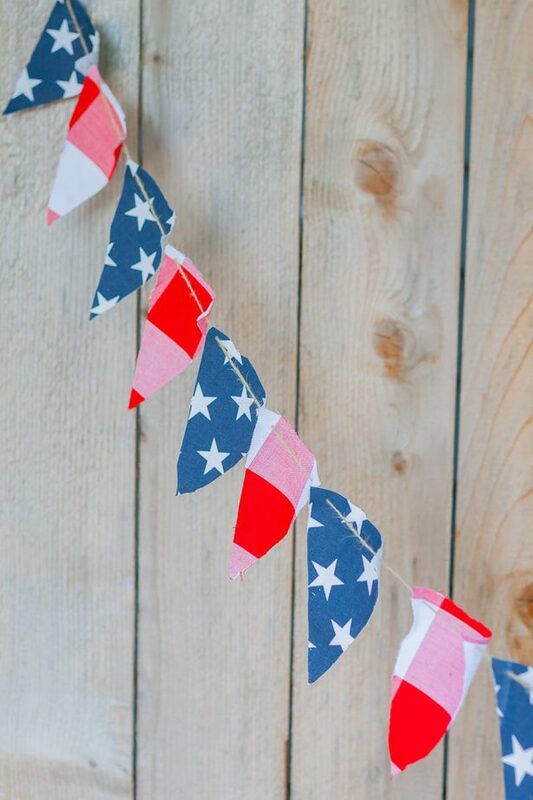 I guess I’m feeling pretty patriotic with my DIYs lately. I got this cotton star fabric from fabric.com. It was not expensive at all and I have a bunch leftover to make some cute outdoor pillows with it! Obviously, the most ideal thing would be to have red striped fabric but this is what I had and I’m all about making things easy. I like the way it turned out too! Literally, this banner took me 20 minutes. I even ironed it at the end. The 20 minutes includes the ironing. Red striped or gingham fabric and blue star fabric. Start by cutting your fabric into little triangles. 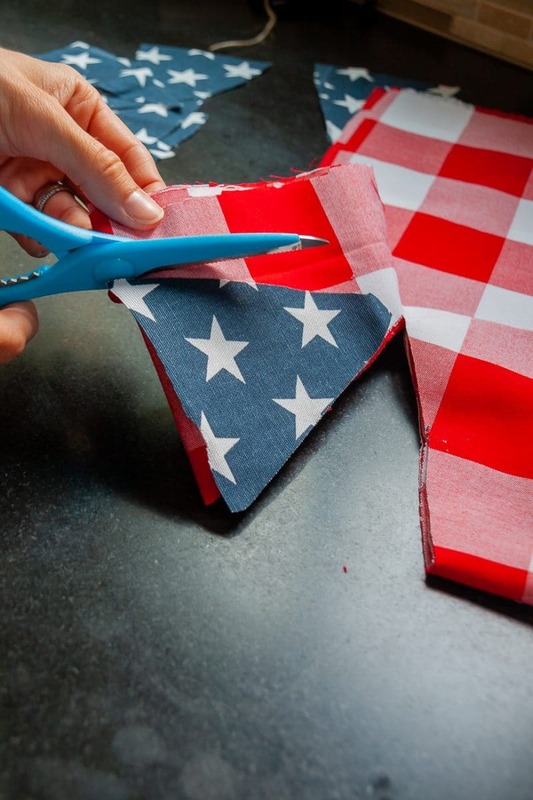 If you fold the fabric several times, you can cut multiple triangles at once saving you precious time. You can use pinking shears for the cutting part if you are afraid of fraying. I like the rustic, tattered look so I just used my plain ol’ scissors. I used one of the triangles as a guide to cut the rest so they were all relatively the same size. Are they perfect triangles? No. I took my jute twine and threaded it through a large, blunt eye needle. 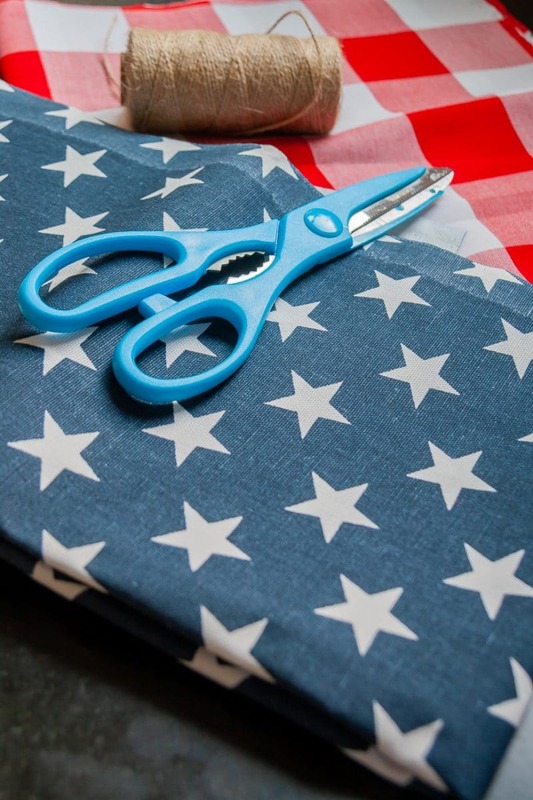 Then I just sewed through each triangle, creating a long banner of red and white patriotic goodness. You can make this as long or as short as you want. You can make many banners and put them all over your house! Tie each end with little knots so the fabric triangles don’t slip off. I really loooooove this! I think it turned out so cute and it cost me practically nothing! Now the fun part. Hanging your banner! For the photos here, I just used tape. You can use command hooks too. I especially like this strung up on my front porch. We have our flag hanging and it just feels very summery out there. Although there is no furniture there right now, so that kinda stinks. If you are going to hang this where people can see both sides, just make sure both sides of your fabric have the pattern. Not all of them do. If they don’t, you can glue or sew two pieces of fabric triangles together. 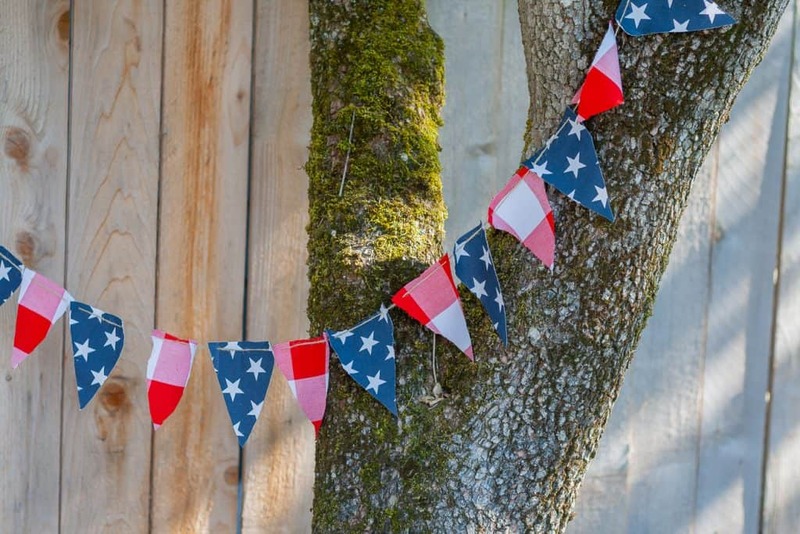 These banners also look great hung on your fences, strung from your outdoor lights and displayed above your buffet table or wherever you are serving your food. Throw a few mini flags in there and call it done! They also look kind of dreamy hung haphazardly from trees. Talk to you soon and thank you for visiting with me today! I am a participant in multiple affiliate programs including the Amazon Services LLC Associates Program, an affiliate advertising program designed to provide a means for us to earn fees by linking to Amazon.com and affiliated sites. For more information, please see my disclosure statement [here]. All images on Decor Hint are copyrighted and taken by me unless otherwise noted. Feel free to contact me if you would like to use any of my images. Thanks!